When techniques like linear regression or time series were aimed at modelling the general trend exhibited by a set or series of data points, data scientists faced another question - though these models can capture the overall trend but how can one model the volatility in the data? In real life, the initial stages in a business or a new market are always volatile and changing with a high velocity until things calm down and become saturated. It is then one can apply the statistical techniques such as time series analysis or regression as the case may be. To go into the turbulent seas of volatile data and analyze it in a time changing setting, ARCH models were developed. When we are looking at variance of error terms, there can be a lot of patterns and one of the most common among them is a repetitive one. Volatility clustering, as it is called is a pattern which comes from clustered volatility periods or, in other words, repeating pattern of high and low volatility periods. GARCH models quite suitably capture volatility clustering trends in data. One needs to remember here that whether ARCH and GARCH are applied, they do not explain trends in error terms but only capture them. This also means that GARCH is more focussed on the occurrence of spikes and troughs than their level. You can know when we can witness a possible decline or steep rise but should not rely on how much will that change be. Naturally, such a problem requires a lot of data. We’re talking about tens of thousands of observations just to model the peaks. Since GARCH is based on ARMA modelling, we use the GARCH(p,q) notation to indicate the AR and MA components. One of the most popular GARCH models is the GARCH(1,1) model. The exact values of p and q are then estimated using maximum likelihood. However, we do not generally depend on the assumption of normality of data rather, we use t- distribution which fits long tailed distributions. Other long tailed distributions are also suitable and can be used. To test the goodness of fit, we usually check autocorrelation in squared standardized residuals. A robust test for this is the Ljung-Box test which calculates the Ljung-Box statistic and p-values. Another thing of interest in GARCH models is its persistence. It indicates how fast the volatile spikes decay after a shock and stabilize. In the typical GARCH(1,1) model, the key statistics is the sum of the two parameters commonly denoted as alpha1 and beta1. If the sum is greater than 1 then it means that the volatility will increase and explode instead of decay which is hardly the situation. A value exactly equal to 1 means an exponential decay model. In real life, most GARCH models have the sum less than 1. Since log (1) = 0, if sum of alpha1 and beta1 is exactly equal to 1, the half life becomes infinite. What does it mean? Persistence and half life are derived from training data. If there is a trend in the volatility of the data in training data, then the estimator may be mistakenly calculate an infinite half life based on when it ends. This is another reason why we need tens of thousand of data points for modelling GARCH as a smaller sample will result in higher possibility of errors. These parameter estimates are very important as they are used to make predictions in test data and needs to be checked after model fitting. All these may be a bit hard to digest. Let’s understand more concepts using a practical implementation in R.
There are a lot of garch packages since GARCH models are further specialized in many variations. It is difficult to understand and explain all of them. However, we will go through one of the most popular GARCH packages - fGarch. We will also use the package Ecdat for the Garch dataset. 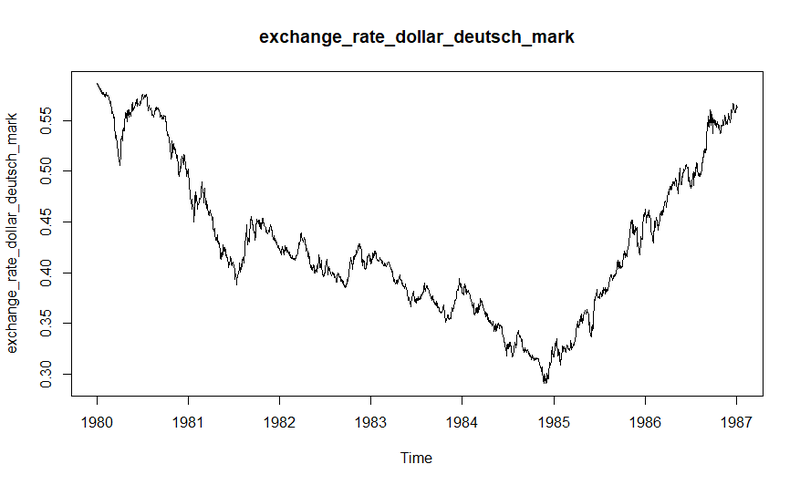 The package contains Garch data set Daily Observations on Exchange Rates of the US Dollar Against Other Currencies from 1 Jan, 1980 to 21 May, 1987, which is a sum total of 1867 observations. We have a lot of small variations across the years as visible from the plot. The next step is to start processing the data. For this, we take the difference of the values. Though we already have the ddm column which provides us the difference, I am calculating the difference separately as the log of the exchange rate and then multiplying it with 100 as it serves as a better representation of the variation. Remember, in economic terms, the difference of the exchange rates is also represented by inflation/deflation as the case may be. 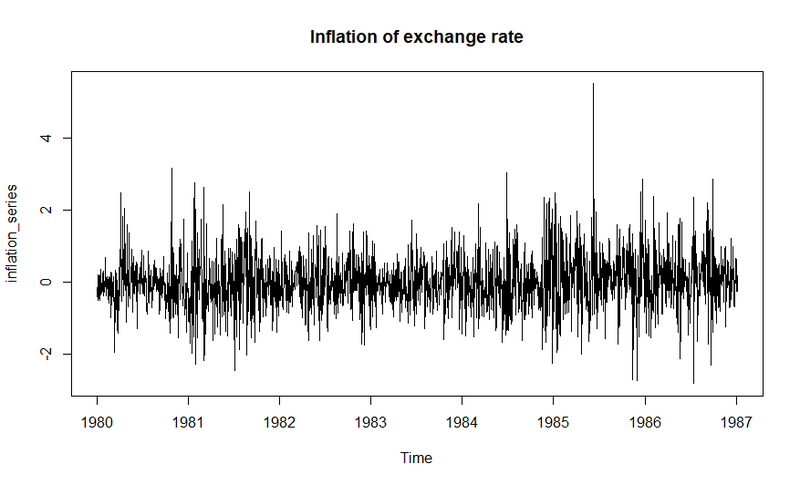 This is the inflation residual on which represents the variability in the original time series. There is a continuous variation without a definite trend or pattern. It even has some spikes such as the one between the years 1985 and 1986 of about 5.5. This is the series which can be adequately captured by using a GARCH model. To make things more clear, we will also see the summary statistics of the inflation series.